Results 1 - 6 of 6 for "ball"
Reference: Boos 1966b: 463, fig. 431; Noguera 1959: 437; Anton 1968: fig. 120. Comments: Fragmented piece. It may represent a young ball-game player with part of his head shaved. Actual Location: National Museum of the American Indian, Smithsonian Institution, Washington, D.C., United States. Provenance: Close to Mitla, Oaxaca. Measurements: 72 x 35 cm. Color: Light grey clay with traces of red pigment. Reference: Boban 1886: 19 (drawing); Nature, 1889: 120, fig. 2; Dockstader 1964: fig. 53; Boos 1966b: 304, fig. 283, Boos 1969: 133, fig. 1. Comments: This piece was taken to France in 1845 by French Consul Martin. Eugène Boban purchased it in 1870 and tried to sell it, unsuccessfully, to the Smithsonian Institution in 1887. He ended up selling it to E. Goupil around 1888. Later, George Heye bought it in an auction in France and took it to his museum in New York. 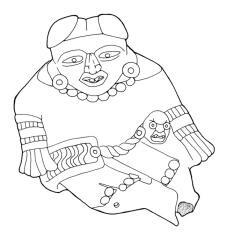 This human figure is holding a jaguar vase in one hand. There is no object in the other hand, but the gesture indicates he once held something. 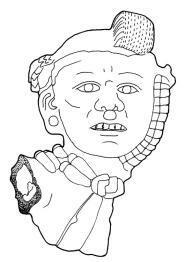 A trophy head hangs from his collar piece that is made up of human maxillae. The piece looks like MFVV 55163 and fragment MFR 1233. It may represent a young ball-game player with his head shaved. Actual Location: Kimball Art Museum, Fort Worth, Texas, United States. Measurements: 72.4 x 53.3 x 45.7 cm. Comments: Large urn of Cocijo. Provenance: Entrance to tomb 58, Monte Albán, Oaxaca. 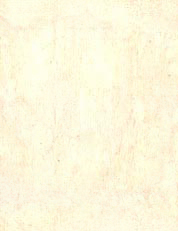 Color: White with traces of red pigment. Reference: Caso and Bernal 1952: 254-255, fig. 400. Comments: This object is very similar to SMI195806 and MFVV 55163 given that the figure wears a collar of human maxillae. 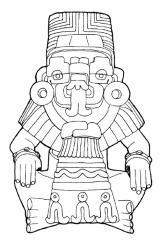 The figure also grasps a trophy head in the left hand, characteristic that can be seen on SMI195806 but hanging around the neck. 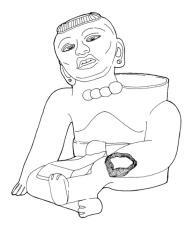 The right hand of the figure is holding a small ball, and the head is stylized to appear like a ball. All these features suggest a connection with ball playing. For other possible representations of ball players see: MFR 1233, SMI 19506, DAM 1971.0350, SLAM 171:1979, SMA 1. Actual Location: Denver Art Museum, Denver , Colorado, United States. Collection: Exchange with another museum. Comments: Representation of a ball game player. A monkey's head is inserted under the left arm. 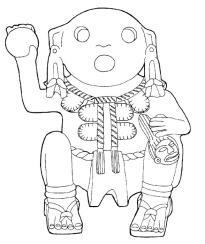 The posture adopted by this human figure suggests that he represents a ball game player. For other objects with similar posture see: BM 1, SLAM 171.1979, SMA 1. For other possible representations of ball players see: MFR 1233, MNA 6-6061, SMI 19506. Color: Grey clay with traces of white paint. Reference: 3 photos from Rickards of the piece in his house; Mexican Art, 1953: fig. 17 (exhibition number: 298). Comments: The posture adopted by this human figure suggests that he represents a ball game player. For other objects with similar posture see: DAM 1971.0350, SLAM 171:1979, SMA 1. For other possible representations of ball players see: MFR 1233, MNA 6-6061, SMI 19506.